February showers make March wildflowers in the desert parks and create yet another reason to explore this beautiful state! During years of average and above average precipitation, it seems every direction you look there's beautiful yellow, red, orange, blue, or purple flowers blanketing the landscape. Try not to be discouraged during the dry years...The desert is resilient and will do its best to impress while propagating the species. Parks at higher elevations see flowers later in the year, around May, and the blooms last well into the summer. There's typically more rainfall up north, which equates to even more beautiful northern Arizona wildflowers. The contrast of vibrant flowers against the backdrop of green is a sight to behold, so get your camera, comfortable outdoor shoes, and plenty of water and enjoy the rich colors across the state. Lost Dutchman had a great showing in 2017, in fact wildflower conditions were nearly optimal. The 2018 season slowed a bit with a lack of timely rainfall and early high temperatures that killed off the young shoots, and the 2019 season was hampered by the late-season freezes. Flowering plants in this park may include, but are not limited to: chuparosas, poppies, fiddle necks, globe mallow, chuparosa, brittle bush, desert evening primrose, blue dicks, lupine, ocotillo, chicory, scorpion weed, skeleton weed, jojoba, mormon tea, phacelia, bluebell, and more! Preview some of the blooms that are on display during the spring on the Lost Dutchman State Park Facebook page. Picacho Peak is arguably one of the best spots to see blooming wildflowers in Arizona, with bushels of incredible golden blooms around the base of the mountain and campgrounds. The desert wildflowers of the park offer a unique and beautiful contrast to the green and brown hues of this Sonoran Desert destination. Experience the trails as they wind through a carpet of yellow, meandering through the desert exposing new beautiful sights each step along the way. Plants, shrubs, and cacti all blooming, seemingly for your pleasure...Enjoy the campgrounds to get the most out of Arizona's wildflower season. Springtime weather is perfect for a desert camping experience, book a trip and expose yourself to the beauty Arizona so selflessly shares with you. Preview the wildflowers on display on the Picacho Peak State Park Facebook page. Catalina usually sees a slightly later bloom than Lost Dutchman, Picacho Peak and other Sonoran desert areas throughout Arizona. This Sonoran Desert dominated park is fed by snow melt through two large washes, which brings cooler temperatures, and consequently, later blooms. 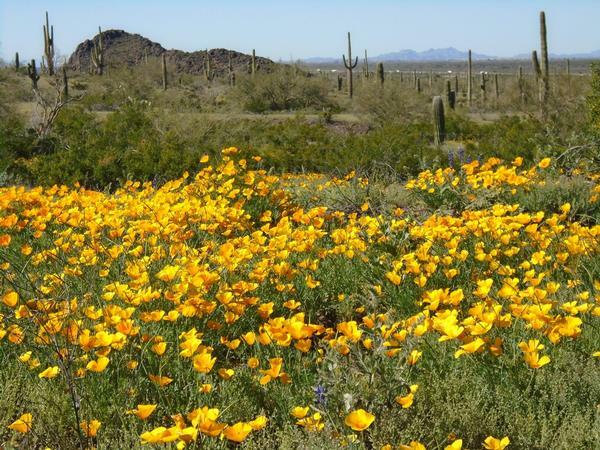 This is actually quite convenient for visitors hoping to extend their wildflower season by visiting this southern Arizona destination after seeing the beauty of other parks across the state! 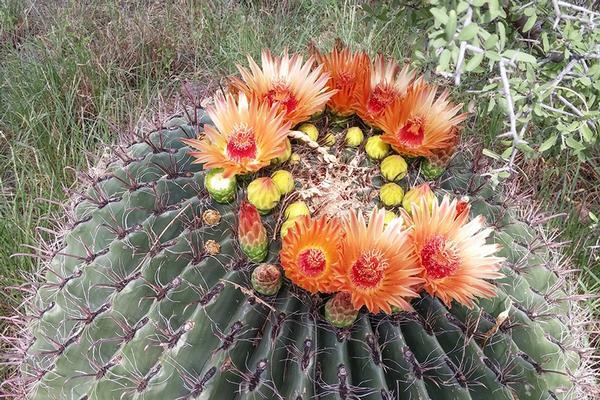 With such a large variety of flowering plants, shrubs, and cacti, this park is really a sight to behold when the bloom is taking place. Springtime brings beautiful sights and aromatic appreciation to park visitors, combine these with a hike through the desert for an absolutely unforgettable experience. 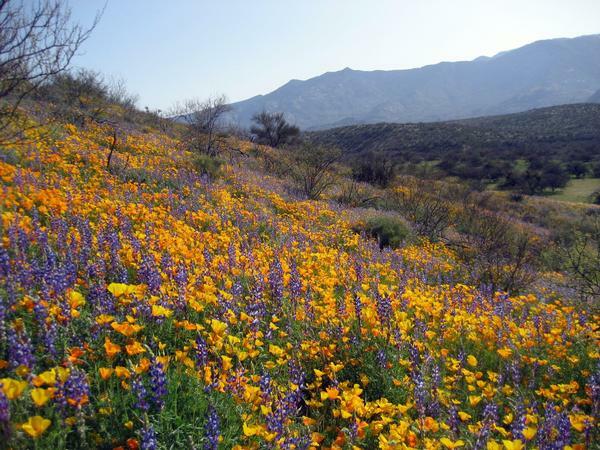 The Catalina State Park Facebook page posts wildflower updates during the spring season. 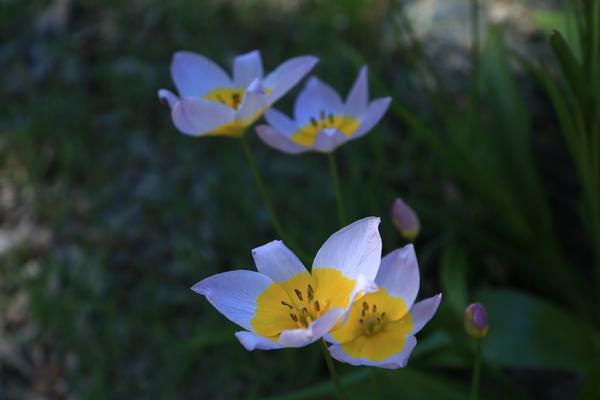 Follow along and visit the park when your favorite plants are blooming! Alamo Lake isn't just for world-class fishing and off-roading! 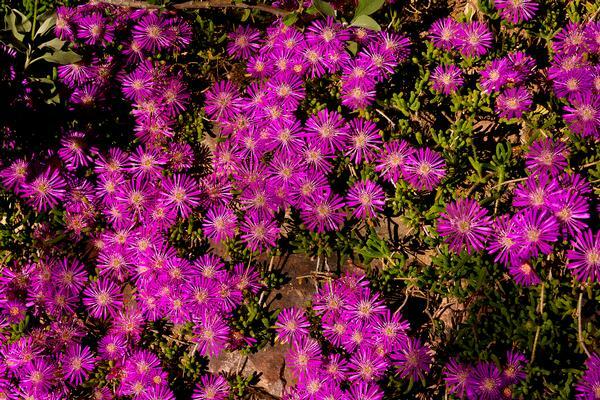 The park has so much more to offer, like amazing blooms that blanket the landscape in late March and early April. The high desert getaway is covered in brittlebush flowers along the shores and hills surrounding the lake, which makes for amazing views on your hikes through the Sonoran desert. The juxtaposition of bright yellow starbursts among desert landscapes is a bucket list item begging to be checked off! Reserve a cabin or campsite to take advantage of all Alamo Lake has to offer, and to see the blooms as they hit their peak of Arizona wildflower season! 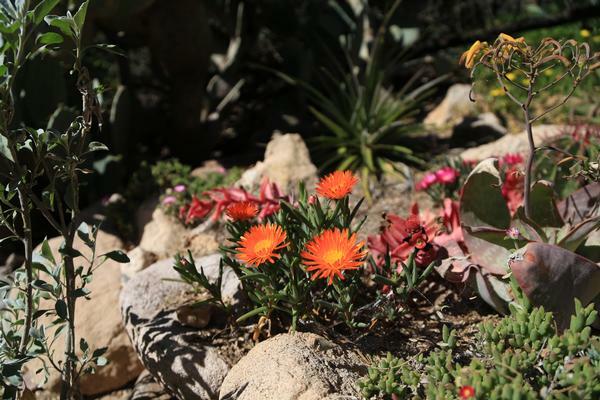 Red Rock rests at a higher elevation, so their wildflower season usually begins in May and continues through mid-June, as long as moisture levels remain high. Due to above average winter precipitation and temperatures, many early spring annual plants may sprout early. Take a peek at what's sprouting on the Red Rock State Park Facebook page. You can always contact the parks by phone to sees what blooms have made their appearance! 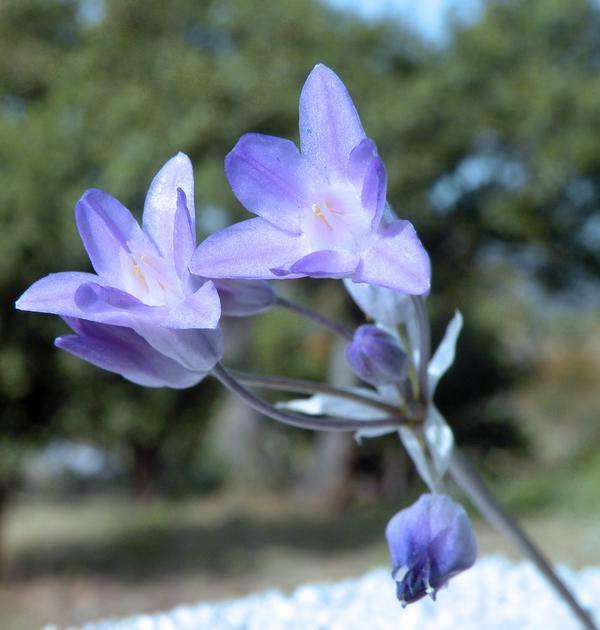 February is the earliest wildflowers will start to bloom, and often they wait until March. The season depends on precipitation and temperature, so you never know what you'll see! Always remember to treat the landscape and blooms with respect, and be careful not to pick or trample the flowers! Help us keep the parks beautiful for visitors to Arizona State Parks!